It was a great first day for Team Ward-Beck at the 2018 AES and NAB New York shows, which are being held concurrently at the Javits Center. Ward-Beck is part of the interop demonstration in the Audio Engineering Society's AoIP pavillion at the AES show. There's a great team there, putting together a neat and informative demonstration on AES67. It's nice to see Ward-Beck networked equipment included! Our PreMo-222 and our other AES67/ST2110 networked audio devices were also featured in the Ravenna and Merging Technologies booths at AES New York. The map of the venues is below. You can pick up a card at each of the highlighted locations. The Ward-Beck team will be around at home base, so you can find us there! Here's to a great day 2! See you all there! This entry was posted in AoIP, NAB Show, News, Press, Uncategorized and tagged ip sho, NAB NEW YORK, AES NEW YORK, interoperability, premo-222, aoip interoperability, interop, aoip on October 18, 2018 by sangavai. 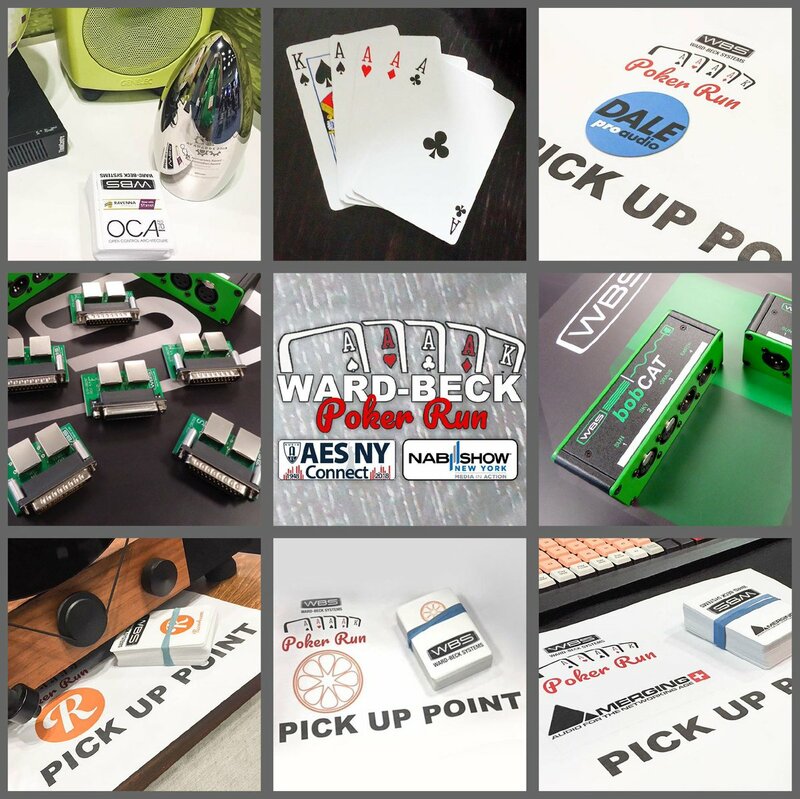 Ward-Beck will be holding our inaugural Poker Run at the NAB and AES New York shows, happening from October 17-19th and October 17-18th respectively. If you are attending the show, you can pick up a card at the eight locations below. Each booth will have a complete deck of 52 cards. Pick up a card at each booth to build your best hand of 5 cards. It will be 5 card stud rules, and best two hands by 2pm on October 19th wins. Please note that exhibitions for AES NY runs from October 17th-19th, while exhibitions for NAB NY only runs from October 17th-18th. Use the map above as a guide. The first and second place prize packs can be seen below, and are a bundle of our best-selling QTP audio routing products. This is one of our most popular product lines, and is compatible with the X246 proposal to AES regarding RJ45 pinout standardization for analog and digital audio. If you're attending, see you in New York, and best of luck at the show! This entry was posted in News, Press, Products and tagged contest, trade shows, nab ny, aes ny, qtp on October 11, 2018 by sangavai.